Eight giant envelopes have been hidden around Jersey every week day until next Wednesday, each containing a fantastic prize. 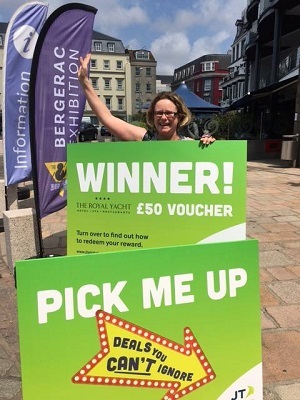 The giant envelopes contain FREE vouchers for well-known brands as part of JT’s Deals You Can’t Ignore campaign ; Islanders are being encouraged to start hunting now to win big! There have already been three winners. To claim their voucher and win, all the lucky envelope finder needs to do is take a selfie with it plus their location, like JT’s Facebook page, JT Social, and post their picture with the hashtag #PickMeUp to our page. Then, take the envelope to the JT Store on Queen Street, where one of the team will exchange it for their FREE voucher.